The median household income in the US was $57,616 in September 2016. Half of households had income above that, half below. 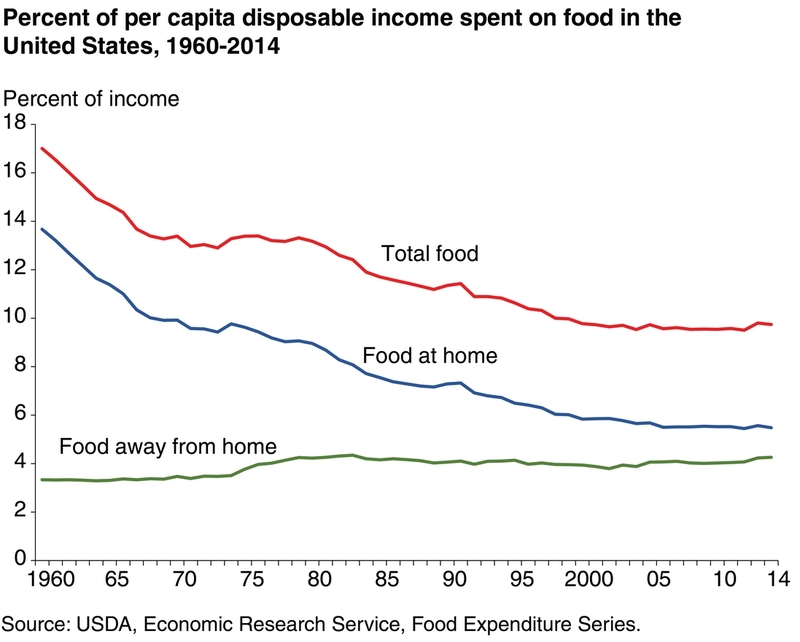 Americans earning a median income spend about $5,646/year, or $470/month, or $118/week on food. If there are 21 meals in a week, that’s about $5.62 per meal for the household. Of course, you can play with those meal numbers. Still, that’s the ballpark. That is middle America. This entry was posted in Uncategorized on June 2, 2017 by Bix. Backlash against this kind of creeping elitism fueled the campaigns of Trump and Sanders. We feed 4 people on $800/month. Some months are closer to $600, whole others top $1000+ when traveling or when visitors are in town. We don’t eat out much. Blue Apron and some other meal kit delivery services I’ve read about have difficulty keeping customers. People try it and give up after about 6 months. Guessing here … I think it’s too expensive, although you’d have to put a price on convenience. Also, people get the hang of cooking on their own. Let me work it backwards … $35/meal times 2 meals a week works out to $280/month for just 8 meals. There are 84 meals in a month, leaving a middle American family 470-280=$190 for 76 meals. That’s $2.50 per meal for a family of 4. I just don’t see how regular people can afford this. Yes. Regular folks don’t afford it. I have looked at Blue Apron and other services like it and have always concluded that it didn’t add up.